ooohh….I LOVE this theme! Just posted two “small” paintings so maybe I’m ahead of the curve for a change! lol! interesting. This is getting me thinking! 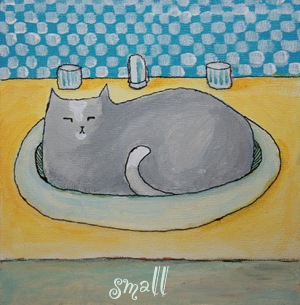 small is good for me. I need to find a way to get back to my creativity, and as usual, starting small, taking baby steps, lowering expectations and pressure is the way I get going. I think I am slowly coming back, so I might be more visible soon. I think I am starting a new series of art pieces. Lets see if they catch on in my brain. Or maybe they will go someplace entirely different. great theme. of course, as usual, I’ll end up not following it and going off on other tangents, but in a…small…way:P Look forward to a creative April! Thanks for the theme, Leah. At first I balked at the idea. I a BIG, LOUD person and artist. This will be good for me to go small and feel less pressure trying to complete larger pieces. Looking forward to it. This theme allows me the gentle inspiration to savor the moments of my dailies … To allow “small” to be enough. Hi Leah, Your kitty is sweetness personified! Small is good! I love how cats always thinks they are so very tiny and want to sleep in boxes and bags that are too small for them. somehow they manage though, right? Love your sketch, made me smile! small, that brings to mind a number of ideas. could be fun. I just started working small again last week. I’m going to continue with this size (5×7) for a while, so this theme is perfect for me. If you don’t have a blog of flickr page to link to, then email me with your first name and last initial and I’ll add you to the list of participants without a blog. Thanks!! I’m just starting out and “small” is a great place to begin. I’m inspired by the 30 boxes idea. I’m going to put a sheet in my day planner now and get doodling. Thank you for facilitating this! Grabbing the beautiful badge too.